An update has been made for the Choice Options script, which provides a number of utilities that allow you to manage your choices. It’s not very useful. 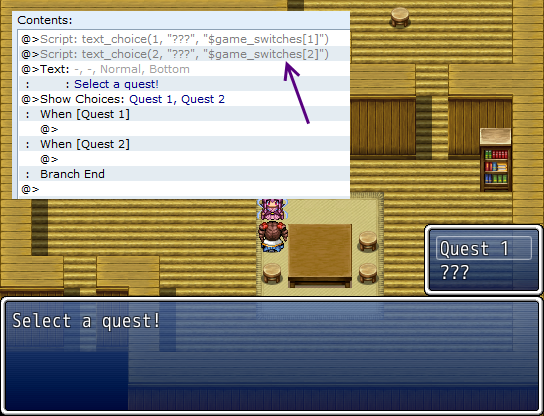 Using the text_choice script call, you can set the text of the specified choice during the game. Now, what happens if you can change the text depending on a condition? I have introduced support for a second string that allows you to specify a formula as the condition. In combination with choice disabling, you can easily create a mysterious unselectable option that will remain mysterious as long as the condition has been met. This is what I call Conditional Text, the latest feature available for your choices. Great idea for an update to this script! Should be very useful. What if you have multiple lines that have a satisfied condition (for example, four lines for the same option, such as the following, in the situation where Switches 1, 3 and 4 are ON? Which one will take precedence? I actually didn’t consider what happens when you assign multiple conditions to the same choice. Previously it just took the last one (from top to bottom) and used that: if the condition is satisfied, then replace the choice text. Otherwise, use the default that is specified in the event. 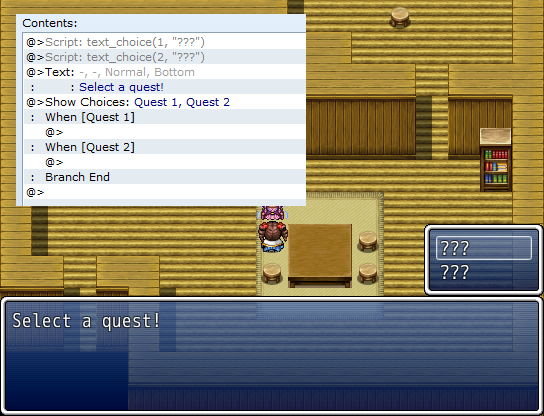 I’ve updated the script so that the last script call has the highest priority, and works its way backwards. If all 4 switches are ON, then “fourth override”. If you turn switch 4 off, then the next highest priority is “third override”.